REGISTER TODAY - DEADLINE Extended until Monday APRIL 22nd!!! Enrichment is a fun and exciting opportunity to expose your child to something new and challenging! 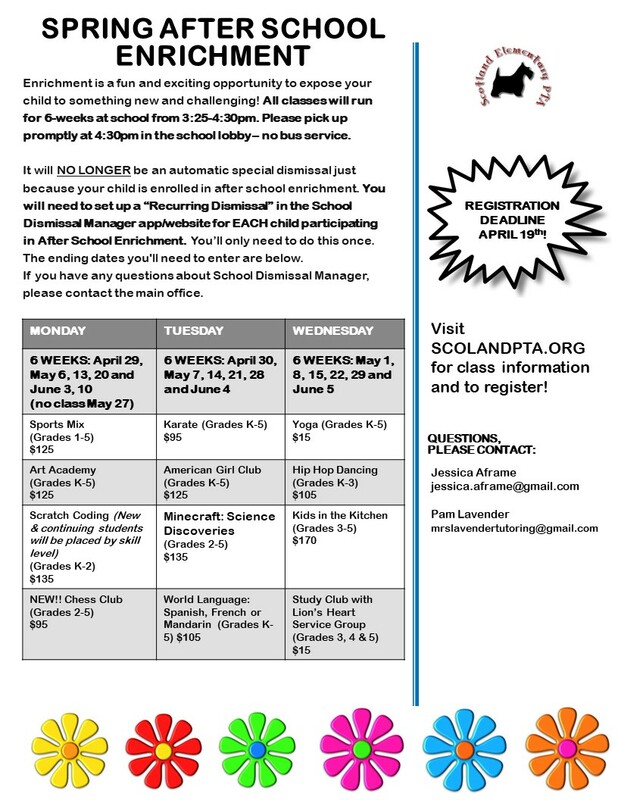 This spring, the PTA is bringing back some favorites like art, cooking, sports mix, scratch coding and more. PLUS, we have also added Chess, Minecraft Coding, Study Club & afternoon Yoga. online by April 19th (no late registrations will be accepted – no exceptions). It will NO LONGER be an automatic special dismissal just because your child is enrolled in after school enrichment. You will need to set up a “Recurring Dismissal” in the School Dismissal Manager app/website for EACH child participating in After School Enrichment. You’ll only need to do this once. The ending dates you'll need to enter are below. If you have any questions about School Dismissal Manager, please contact the main office.